Gypsophila paniculata is more commonly known as baby’s breath or in the floral industry as Mini Gyp. A herbaceous perennial native to central and eastern Europe, it prefers well-drained alkaline to neutral soil in full sun. Its stems are covered with tiny white flowers in summer, giving it the name of baby’s breath. The fullness of the plant makes it a popular backdrop and filler in floral arrangements. It is often simply referred to as “gyp” in the floral industry. What is the difference between preserved baby’s breath and fresh? Preserved baby’s breath lasts much longer than fresh baby’s breath. Fresh baby’s breath has a more vibrant appearance than preserved, but preserved baby’s breath will last almost indefinitely depending on the handling and environmental conditions. Can I buy preserved baby’s breath flowers in bulk? Preserved baby’s breath can be purchased in bulk for the convenience of floral arrangers. As it lasts a very long time it makes sense to purchase a large amount to have available when needed. Do wholesalers get a discount on preserved baby’s breath flowers? If you are a wholesaler wanting a discount on preserved baby’s breath, please give Bruce a call at the farm at 1-800-STATICE (1-800-782-8423). Where can I buy smaller quantities of preserved baby’s breath? We sell our preserved baby’s breath in ¼ lb. bunches. These bunches can be purchased separately or in a case of 12. See our price list above for details. Is preserved baby’s breath the same as preserved Mini Gyp? Preserved baby’s breath is the same as preserved Mini Gyp. Mini Gyp, or simply “gyp”, is the name used in the floral industry for Gypsophila paniculata, the scientific name for baby’s breath. Are preserved baby’s breath flowers good for bouquets, arrangements and wedding decorations? While fresh or preserved baby’s breath are more commonly used in bouquets, arrangements, and wedding decorations, preserved baby’s breath is used as well especially when a vintage look is desired. Preserved baby’s breath combined with other preserved flowers make an arrangement that will last for a long time. Is it cheaper to buy preserved baby’s breath flowers in bulk? We offer a discount for buying bulk amounts of preserved baby’s breath. Refer to our pricing schedule above for details or call Bruce at the farm at 1-800-STATICE (1-800-782-8423) to discuss larger amounts. 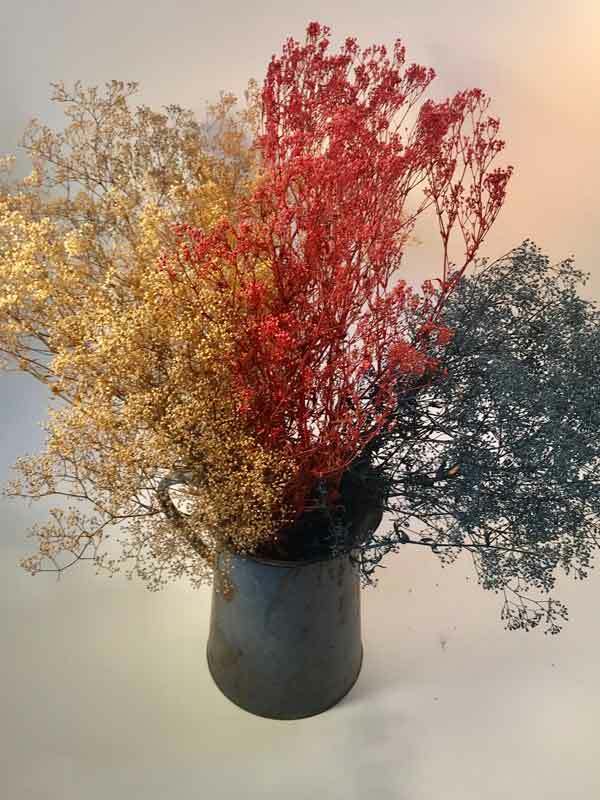 What can you do with preserved baby’s breath flowers? Preserved baby’s breath can be used for a variety of purposes. In addition to being used with other preserved flowers in long lasting arrangements, it can be used to add a vintage look to home decor, centerpieces, and wedding bouquets. How long do preserved baby’s breath flowers last? Preserved baby’s breath can last for many years. It will not last as long in humid conditions as in drier environments. It is more fragile than fresh baby’s breath and will not stand up if it is handled often. 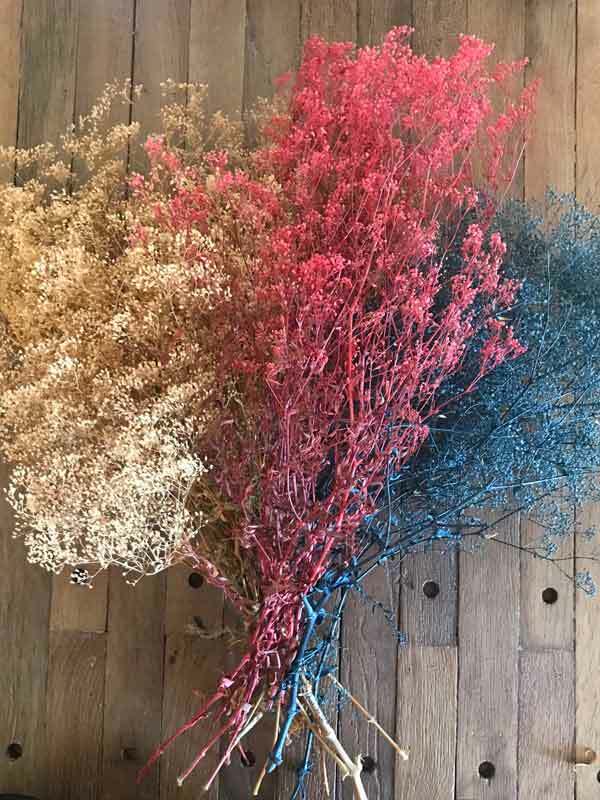 What colors does preserved baby’s breath come in? We do not dye our preserved baby’s breath as we do our preserved baby’s breath. 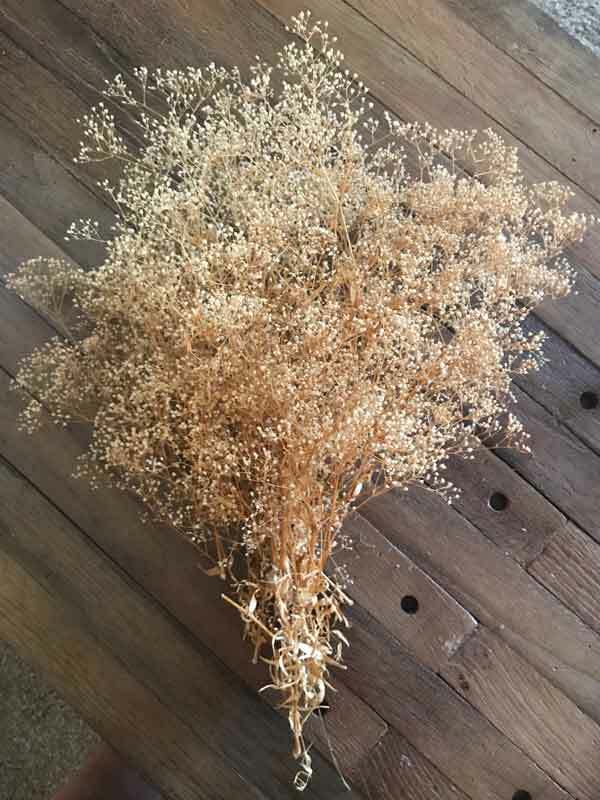 During the drying process the baby’s breath loses the green in the stems and the white of the flowers and both turn a tan color which is desired in the types of arrangements it is used for. 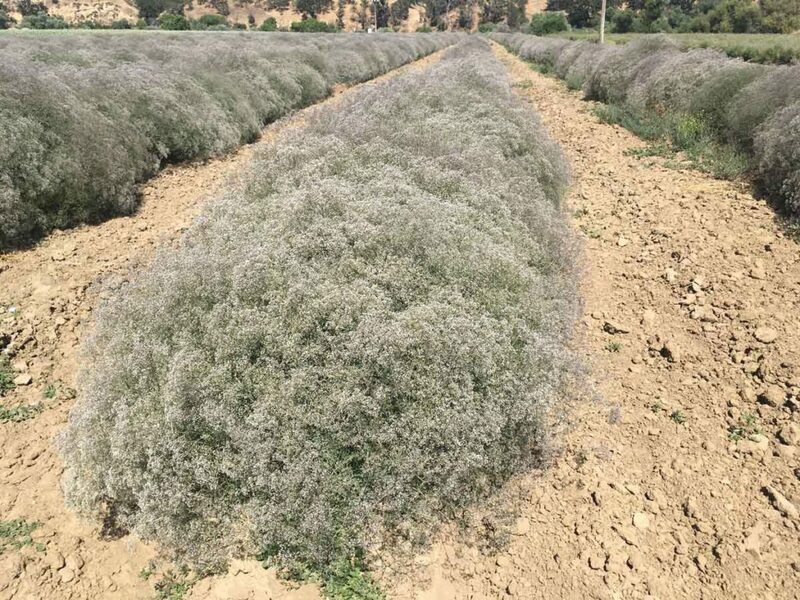 The Natural Mini Gyp is grown in California and comes in the natural color and colored seen above and can be purchased by calling Bruce at the flower farm (1-800-STATICE). This flower is harvested and then dried and packaged for our clients. You can request an assortment of different packaging sizes and weights. Other dried, preserved, and specialty flowers from Natures Harvest. Dried German Statice, Dried Caspia, Preserved Caspia, Preserved Eucalyptus, Preserved Baby’s Breath, Dried Baby’s Breath, Dried Lavender, Pepperberries, Dried Larkspur, and others. Nature’s Harvest has perfected its harvesting operation to ensure the finest quality product is available in huge quantities. As soon as the best blooms appear, the German Statice is cut, packed fresh in custom designed boxes with ventilating air holes, dropped in the field to dry. Once dried, it is taken directly to the storage barn to prepare for shipping. All shipping charges are paid by purchaser unless a written agreement is approved by Nature’s Harvest. Prices subject to change without notice. No returns without written quthorization from Nautre's Harvest. 1.5% charge on unpaid balance past 30 days. Customer responsible for all legal and collection fees if account goes past stated terms. All monies payable at address of grower. All orders subject to availability of product.